AstroGrepFiddlerLINQPadXRMToolkitTeam Foundation SidekicksWinDirStatJustDecompileCodeCompareSearch EverythingSMTP Diag ToolHTML CheatSheetRight Click "Command Window here as Administrator"ScreenToGif - Screen, webcam and sketchboard recorder with an integrated editor. Microsoft is no longer providing the entire SDK and samples as a download. Instead they are hosting the samples on a their website and providing the sdk and tools on nuget. You can get the tools inside Visual Studio by adding the nuget package but if you just want to download them to a folder on your computer they also have provided a PowerShell script to help you do that too. 1. In your Windows Start menu, type Windows Powershell and open it. 2. Navigate to the folder you want to install the tools to. For example if you want to install them in a devtools folder on your D drive, type cd D:\devtools. 3. Copy and paste the following PowerShell script into the PowerShell window and press Enter. 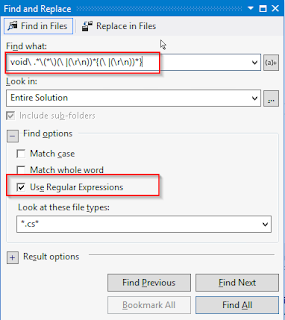 To find empty methods in Visual Studio search using the following regular expression. In needing to test client configuration and keep them in the same domain as our server we recently needed to add some Windows 10 machines to EC2. It was a bit of a surprise that there were no AMIs available for Windows 10. Instead we needed to create our own VHD and import it as an AMI in our EC2 isntance. 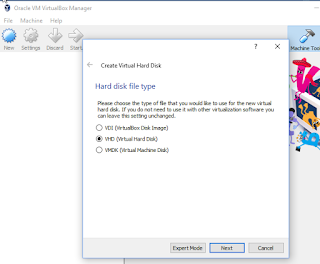 Download and install Oracle VM VirtualboxDownload your Windows 10 ISO file.Create a new Windows 10 VMWhen creating the hard drive make sure to choose the VHD format. I chose Fixed size for the storage on the hard disk. I have not tried using Dynamic. 2. Make sure your CLI configuration is up to date. 3. Create your bucket on S3 if it's not already there. 5. After you run the command the output window will provide you feedback as to how much of your download is complete and your current upload speed. 1. Install Python. Use Python 2.7.9+ or Python 3.4+ which will insure you get the PIP installer included. If you are using a previous version of Python you will need to go through a separate setup procedure for PIP. 2. Open a command prompt As Administrator and run the following. 3. Test to make sure that the install was successful. Most of the time i use late bound but there are times when early bound makes things easier. I needed to limit the size of the file so filtering down on just the entities i use was needed. Luckily Eric Pool create a quick way to do this already.